The poet Wallace Stevens once wrote of “spring’s eternal green” to symbolize the natural process of renewal and persistent rebirth of life. In a similar spirit the architect Alfred Preis designed the Tree of Life, a universal symbol of renewal, into the USS Arizona Memorial 50 years ago. 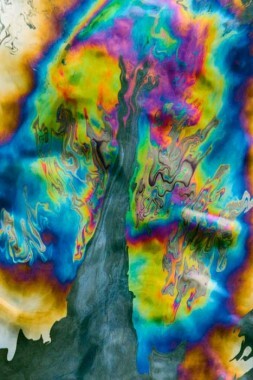 I discovered my oil on water Tree of Life while experimenting from the deck of the Memorial with an up close look at the Black Tears. What a gift!